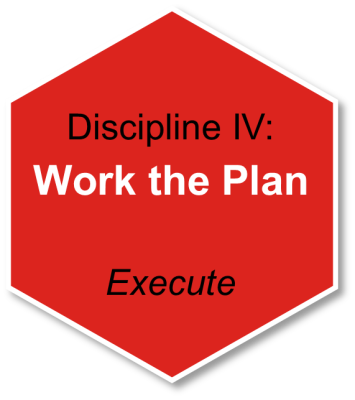 Located in northwest Ohio, Six Disciplines Consulting Services (SDCS) helps organizations improve performance by providing strategic planning and execution services and Baldrige Performance Excellence Program (BPEP) support services. Additionally, SDCS also provides value-added services in the areas of executive coaching, process improvement, analytics and organizational culture. SDCS was originally established as a company-owned franchise by Six Disciplines Research in 2003. 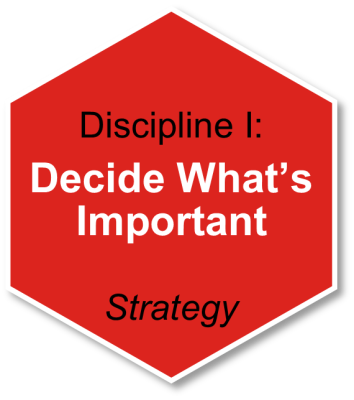 Six Disciplines Research was founded on the strongly held belief that too many strategic plans have been created and not acted upon. 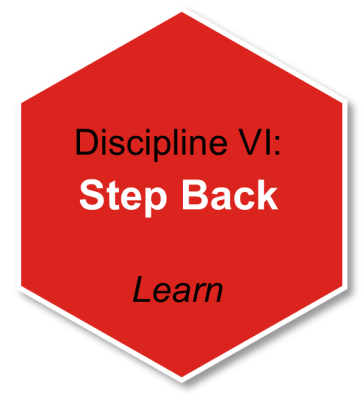 Gary Harpst, the founder of Six Disciplines Research, envisioned a better way, and created a formal strategic planning and execution methodology along with software tools to support the process. In 2005, Six Disciplines Consulting Services became an independently owned organization when purchased by John Crawford and then by Eric and Lisa Kurjan in 2006. 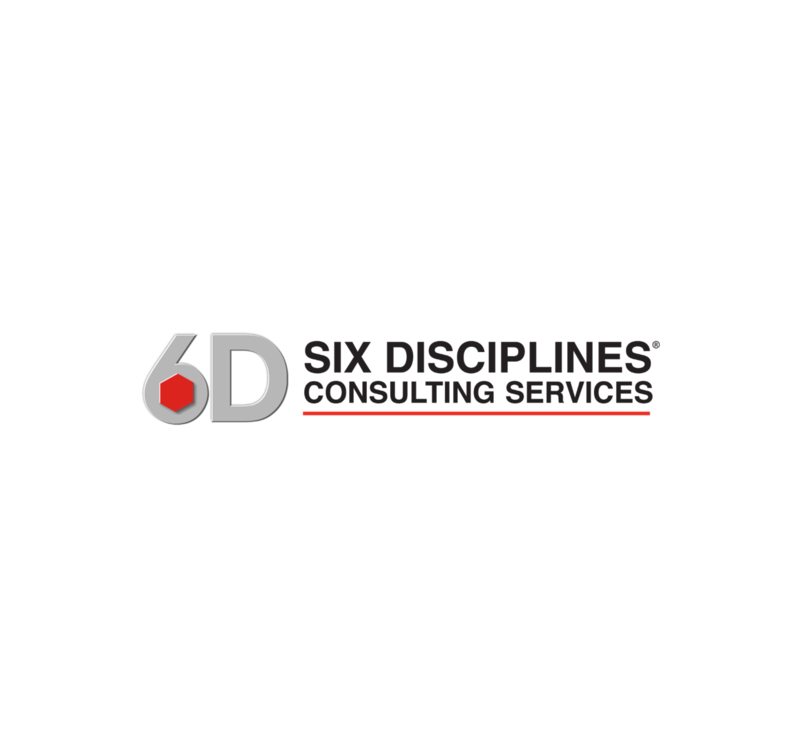 Today, Six Disciplines Consulting Services remains the preferred provider of services for Six Disciplines Research, serving nearly 100 "ful-time" clients nationwide, while expanding to offer additional products and services. In Discipline I our coaches ask and record the answers to questions like: Why does this organization exist? What specific markets are we going to serve? Who are our competitors? What are we going to invest in to be distinctively different than our competitors? What are we going to "stop" doing? 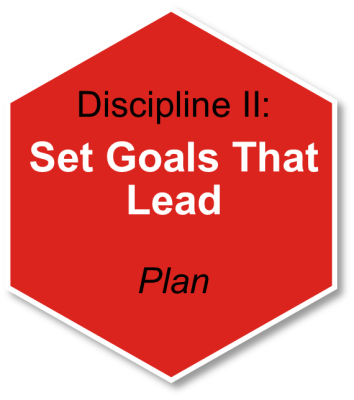 Well-defined goals are among the most effective communication tools available to any leader—and the most underutilized. Our coaches ask where the organization wants to be 10 years, 3 years and 1 year from now in measurable terms from a financial, customer, production processes and people perspective. We ask: What is the growth strategy in terms of products/services, channels of delivery and geographic territories? We ask what the plan is to inform and engage team members in the strategy on an on-going basis. 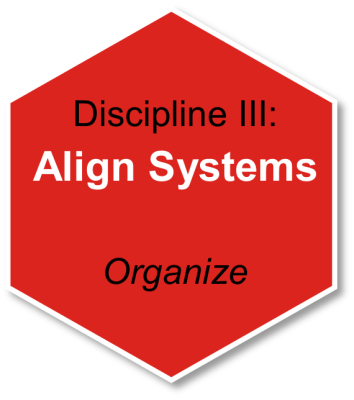 In this discipline coaches ask what the strengths, weaknesses, opportunities and threats their particular team must address in their operating plans to align with the organization strategy. 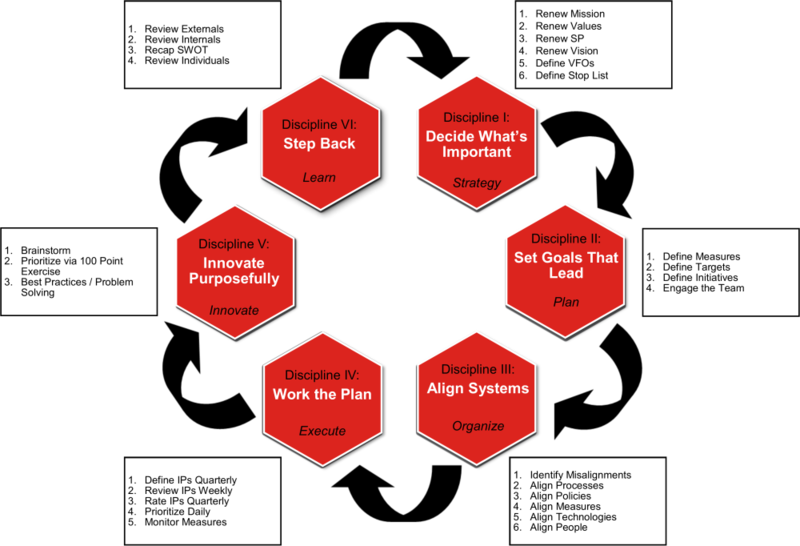 Cross-functional change initiative teams are asked to define clear outcomes, produce a schedule for each project and identify the required resources. Who is responsible? What measures and targets are required to align with strategic goals? Most organizations don't fail because they don't know what to do but because they don't do it. Coaches ask teams and individuals: what are the vital few things you need to get gone in the next year, next quarter and next week to meet company goals? We ask people whether their goals are on schedule? Whether targets are going to be met? We ask who their accountability partner is? We ask people when the goals are completed whether the results were achieved? 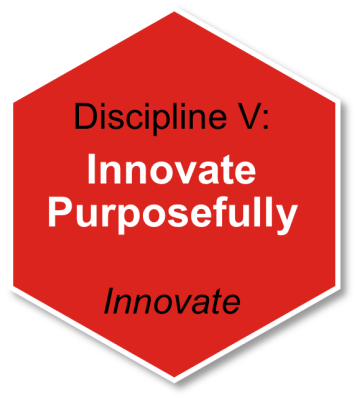 Innovation is just another name for problem-solving, and everyone in the organization has the ability to solve problems. When faced with unexpected problems or opportunities our methodology instructs individuals to ask 7 times why the problem is occurring to help get at the root cause. We ask teams to brainstorm on how to solve problems within the constraints of goals. We ask them to listen to each other as individuals explain their perspective on the problem. To facilitate learning our coaches ask organizations: What are external trends that affect our organization which are outside our control? What opportunities do we have that should be addressed in our strategic plan? What internal weaknesses do we have? Where did we not meet our goals and why? We ask individuals what their peers, managers and direct reports on what they think of their work? What are they going to do in the next year to develop professionally?